Superman vs. Batman - Who Would Win? Superman vs. Batman – Who Would Win? The Man of Steel and The Dark Knight. Two of the most famous characters from the DC Universe go head-to-head in the eternal debate: who would win in a fight? Superman and Batman go way back. They’re great friends and team up in the Justice League, though Batman always has his reserves. To be fair, the hooded hero doesn’t trust anyone! Although the two caped crusaders are often compared in terms of physical ability or intellect, one thing is certain: it won’t be easy for either of them to win. Superman isn’t a Jack of All Trades. Superman is the front-runner of all superheroes, with a host of superpowers that seem almost unfair to compare. Flight? He’s got that. Super-strength? Superman bench-pressed the entire Earth. Not to mention he’s got laser vision, super-speed, ice-breath, invulnerability…heck! Superman once turned back time by flying around the Earth really fast. How could any other superhero compare to Superman? He’s got a repertoire of powers that is unparalleled in pure fighting ability. Sure, his weakness is kryptonite, but it’s not like everyone has a stash of them lying around, right? Say hello to “the man with a stash of kryptonite lying around!” Batman and Lex Luthor would probably pose the greatest threat to ‘supes, since they both have the resources to procure Superman’s greatest weakness. But Batman’s greatest strength is not in his ability to access Kryptonite – it’s in his ability to think. There’s a saying that you can be anything you want. Unless you can be Batman. Always be Batman. This isn’t just because he’s dressed up in a cool costume with a plethora of funky gadgets. Batman is a master of both intellectual thought and fighting ability, with a contingency plan for nearly everything. Can Batman beat Superman? Well, let’s put it this way. Superman couldn’t beat his arch-nemesis Darkseid, who Batman easily thwarted in the events of Apocalypse. Strength doesn’t equal smarts. Batman could probably beat anyone with enough time. But how much time is enough time? How much time would you need to beat Superman? You can find out yourself by getting your own Batman costume! 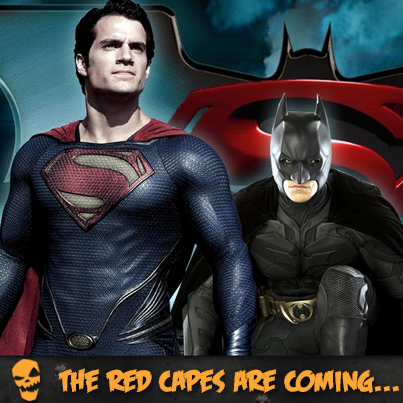 Or, would you rather don the red cape of Superman? Think fast. With only 23 days left until Halloween, time is of the essence! Let us know on Facebook which hero you’d bet on in a fight, and earn a chance to win $25 towards your favourite Superhero costume! Follow us on Twitter and Instagram for more super-powered, Halloween goodness! Top 4 Medieval Halloween Characters You’ve Always Wanted to Cosplay!